Cinnamon is a beloved kitchen spice with a sweet, spicy flavor most people enjoy. However, what we know of as a familiar spice in the form of sticks is really the bark from two related, but different cinnamon trees: Cinnamomum cassia from China or Cinnamomum zeylanicum from Sri Lanka (Ceylon). C. zeylanicum is also known as "true" cinnamon and more costly than than the thicker Cassia variety. Either cinnamon stick will work for crafts and the same cutting technique works for both cinnamon stick varieties. Line up cinnamon sticks on a cutting board with the flatter, curled-in side down so they do not roll. 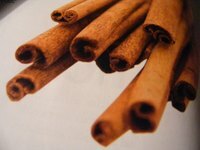 Place a ruler next to the cinnamon sticks lengthwise to measure the length. Mark across all of the cinnamon sticks at the desired length with a pencil, then set the sticks aside. Pick up one cinnamon stick and place it on the cutting board. Score all the way around the stick circumference at the pencil mark with a serrated knife, turning the cinnamon stick on the cutting board as you go. Cut the cinnamon stick across the scored mark using floral shears, then clip any stray edges. Sand any rough edges on the cut edge using a piece of sandpaper. Continue scoring and cutting cinnamon sticks one by one until you have enough cinnamon sticks cut at the the length you need for your project. You can also use pruning shears in place of floral shears to cut cinnamon sticks. If you need more than several cinnamon sticks for a craft project, buy the much cheaper craft cinnamon sticks at a craft store instead of food-grade cinnamon at the supermarket. Dave's Garden: Will the Real Cinnamon Please Stand Up?